Unfortunately, at the young age of 45, Jim has passed away after a long, brave battle with cancer, but his legacy lives on. He was a truly inspirational individual and our thoughts and prayers are with his wife, Sam, and two children. From his humble beginnings as a Gaelic footballer trying to learn how to play Aussie rules to his recent courageous battle with cancer, Jim consistently displayed traits that we can all learn from. His list of awards as a footballer is very impressive, winning the coveted Brownlow Medal as the Best and Fairest player in the AFL in 1991, 4 time club B&F winner, 2 time All-Australian, AFL Hall of Famer and member of the Melbourne Football Club Team of the Century. But as with most great people, his achievements reach far beyond the sporting field, so what principles can we learn from the life of Jim Stynes? Be strong in mind and body. Whilst winning the Brownlow is an astonishing achievement for someone who only started playing at the age of 18, perhaps his greatest footballing achievement is playing 244 consecutive games, breaking a long-standing record and setting a mark that may not be broken in our life-time. For those not familiar with AFL, that’s over 10 seasons of gruelling, physical impact without ever missing a game. Whilst he was blessed with terrific natural athleticism, it’s not as if he didn’t play with pain during that time as he suffered compound rib fractures and medial ligament tears that still didn’t stop his incredible streak. It was Woody Allen who said that 80% of success is showing up, but I’m constantly astonished at how unreliable some people can be, making soft excuses for not turning up to work, school or other events that can positively impact their long-term success. From now on, when you find yourself questioning if you can make it to an important event, think to yourself, “Would Jim have made it?” Most of this battle isn’t physical, but mental, so start winning that battle in your mind and push through. Give something back. Despite being such a champion athlete, Jim wasn’t satisfied with just making a contribution on the field and he went on to start the Reach Foundation, aiming to significantly improve the lives of young people, building self-esteem, confidence and hope. Reach’s vision is, “That every young person has the support and self-belief they need to fulfil their potential and dare to dream.” This is a terrific goal and this foundation has impacted the lives of thousands of young people since being founded in 1994. Jim’s efforts are not just to be applauded, but replicated. The reality is that most of us are very fortunate and have a responsibility to give back to our community. As a Christian, I find Jesus’ words in Matthew 25:31-46 to be very challenging in this respect and hope that I can continue to look for opportunities to make contribution to those less fortunate than myself. Keep smiling. Sadly, Jim has recently lost his long battle with cancer, but his positive attitude throughout his treatment meant that he continued to live a generous life that didn’t seem to focus on the obvious negatives of his health, but on the positives of his family, football club and charity work. He was a genuine class act, and his positive demeanour consistently showed this to the very end. It was Randy Pausch who said,” We cannot change the cards we are dealt, just how we play the hand.” Sometimes, life doesn’t seem to go right and we are faced with significant health, financial, relationship, spiritual, emotional or other challenges that seem daunting. Getting bitter and twisted about it never helps and whilst a positive attitude doesn’t make everything automatically turn out rosy, it does help to equip you for the challenges ahead. 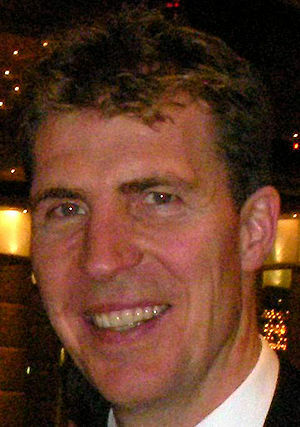 What inspired you about the life of Jim Stynes? Morning buddy. Just read your post. The reminder to remain positive was timely. FYI I noticed a typo (highlighted below). From [[[NOW]]] on, when you find yourself questioning if you can make it to an important event, think to yourself, “Would Jim make it?” Most of this battle isn’t physical, but mental, so start winning that battle in your mind and push through. Thanks Andrew, I’m glad that the post was timely. Thanks for noticing the typo, I’ve corrected it now. Having recently discovered that electrical equipment especially near one’s bed such as phones, clock radios and the like may be instrumental in preventing us from getting better after cancer I wondered if anyone had told Jim Stynes re needing to watch this angle. Plasma TV’s, mobile and cordless phones, wireless internet etc. and even the new low energy light globes or CFLs can all lead to health issues in susceptible people. Simply look up EMR health issues on the net. Hope this can help. Thanks Audrey. From what I have read, it looks as though Jim and his family are leaving no stone unturned in their quest for a full recovery. Thanks for your suggestions. And when I want to give up I too ask, what would he say to me? He’d never lete quit and he’d remind you of your infinite possibilities. I’ll never make a mistake with his determination and guts leading my way.